But a diabolic front man would be nothing without the support of the music itself, and here the Hellvetron also succeeds. Ominous, drudging beats are laid out below the raw, filthy guitar tone. Doomed, drawling chords are interspersed with primordial late 80s death metal tremolo guitar lines which occasionally scale into a higher register like redeemed souls that are on the verge of escaping the conflagration until they are suddenly jerked back down by their horned and hooved tormentors. Haunted, brooding chants and other atmospherics are asserted liberally wherever they can exponentially improve the sheer horror of the spacious, reverb saturated gutturals, and let's get something straight: you will not come away from this album smiling unless you are one of the sickest fucks in all Creation. 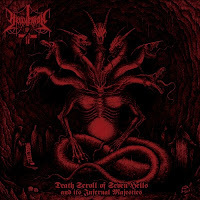 It is the stuff of pure nightmare, just as subterranean and menacing as any of the 'cavern core' Incantation clone death metal, and the Old Testament-rooted darkness of the titles and lyrics make it all the more harrowing and 'ancient' in tone.